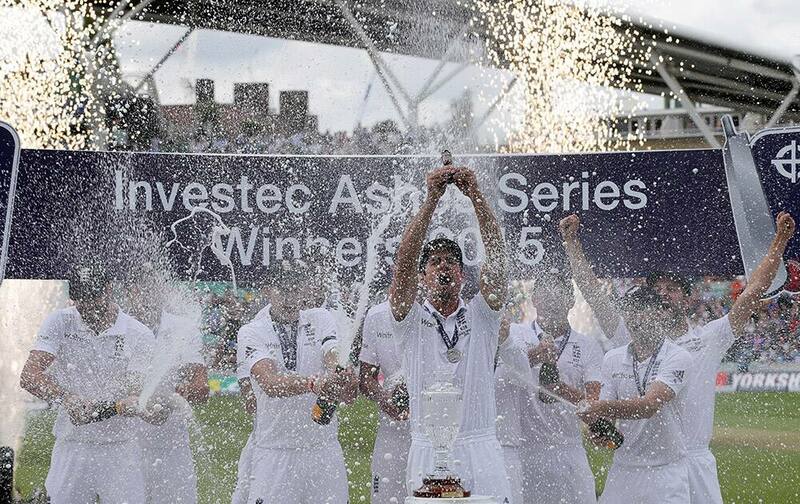 England’s captain Alastair Cook holds up the Ashes Urn during the presentation ceremony on the forth day of the fifth Ashes cricket test between England and Australia at the Oval cricket ground in London. 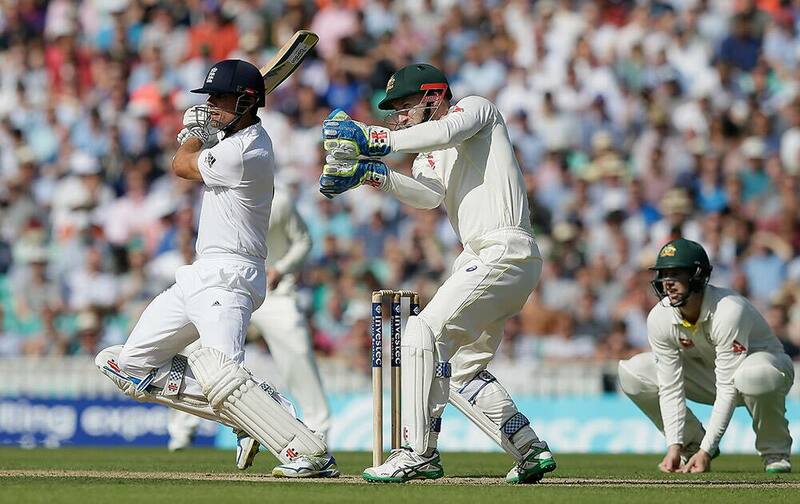 England’s captain Alastair Cook covers his face as he is sprayed with champagne during a presentation ceremony on the forth day of the fifth Ashes cricket test between England and Australia at the Oval cricket ground in London. 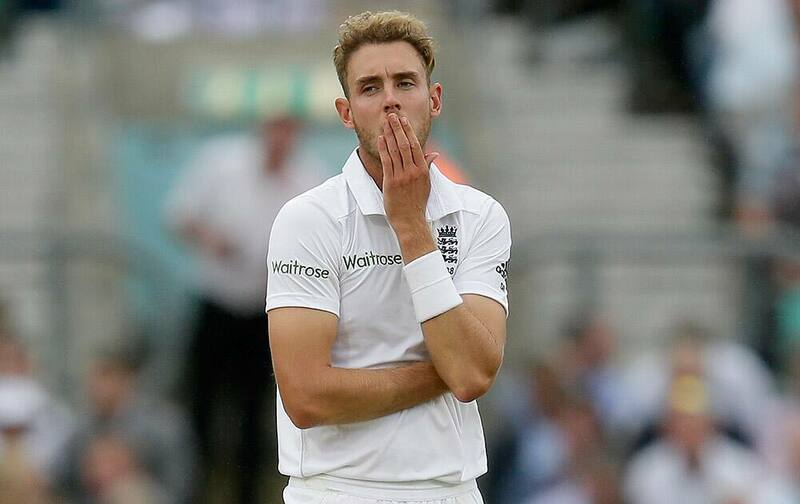 England’s Joe Root kisses the Ashes Urn as he poses for a photograph following a presentation ceremony on the forth day of the fifth Ashes cricket test between England and Australia at the Oval cricket ground in London. 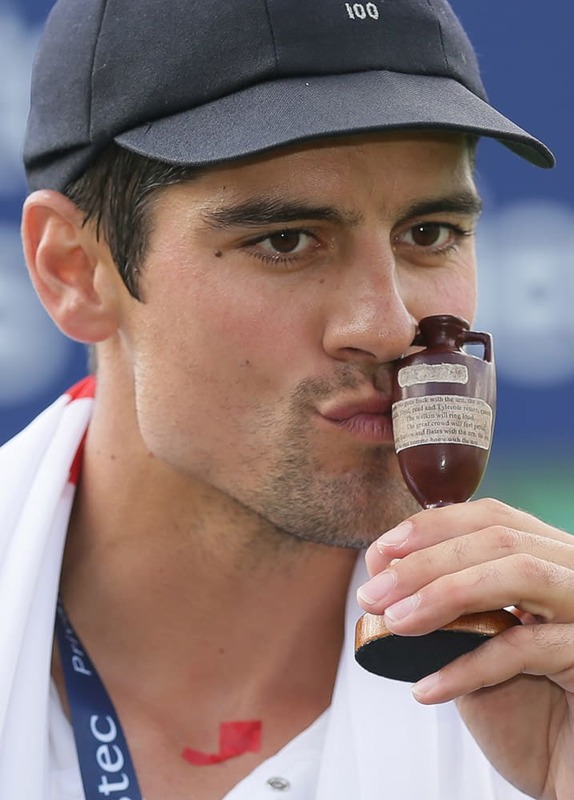 England’s captain Alastair Cook kisses the Ashes Urn as he poses for the media following a presentation ceremony on the forth day of the fifth Ashes cricket test between England and Australia at the Oval cricket ground in London. 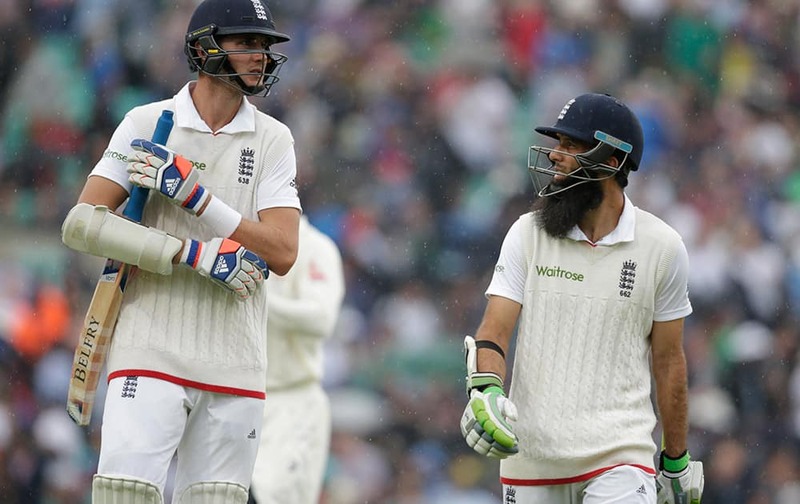 England’s Moeen Ali, right and England’s Stuart Broad walk off the pitch as rain falls to delay the match on the forth day of the fifth Ashes cricket test between England and Australia at the Oval cricket ground in London. 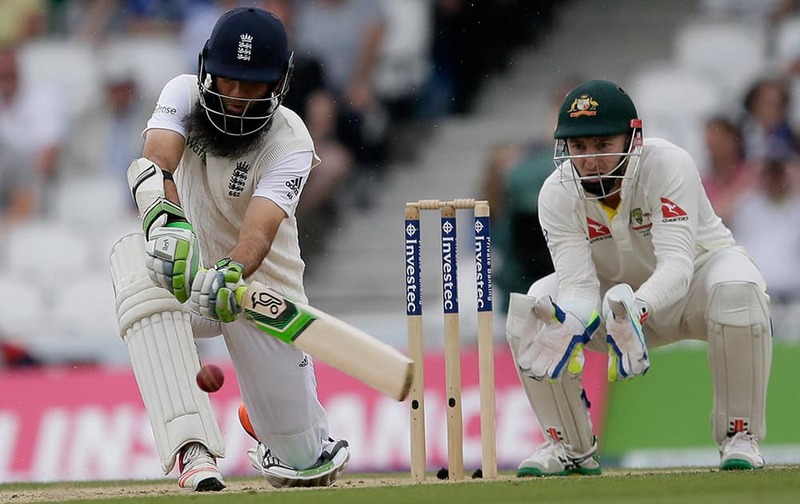 England’s Moeen Ali plays a shot off the bowling of Australia’s Nathan Lyon on the fourth day of the fifth Ashes Test match between England and Australia, at the Oval cricket ground in London. 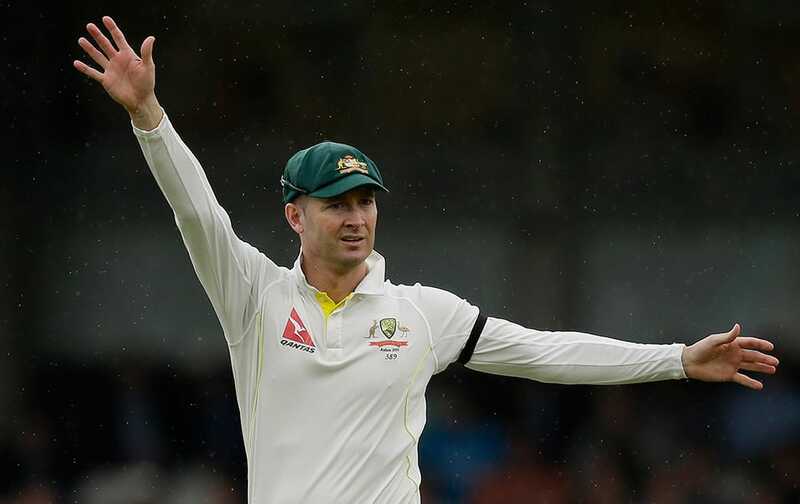 Australia’s captain Michael Clarke directs his players on the fourth day of the fifth Ashes Test match between England and Australia, at the Oval cricket ground in London. 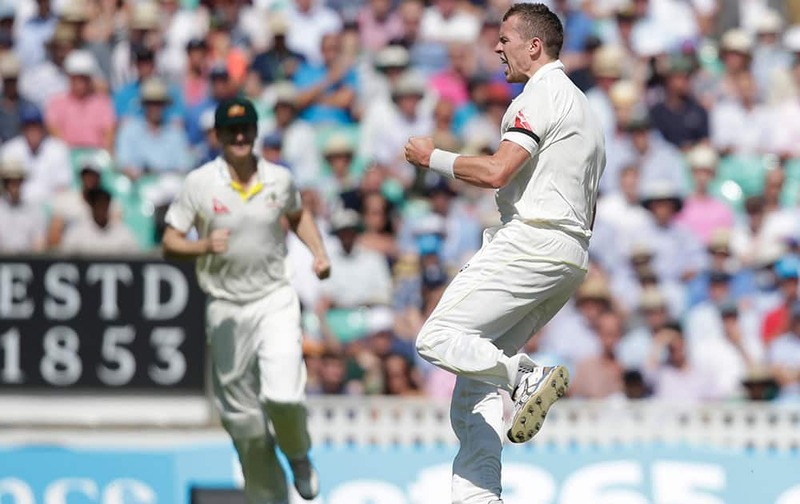 Australia’s Peter Siddle appelas for a wicket on the forth day of the fifth Ashes cricket test between England and Australia at the Oval cricket ground in London. 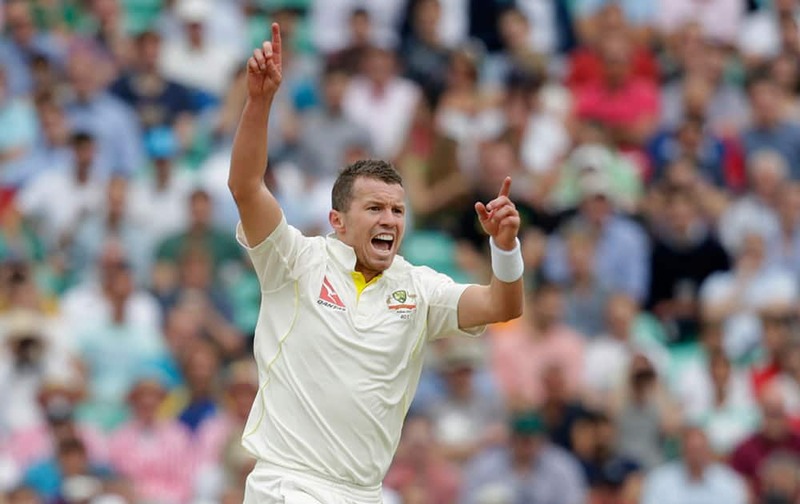 Australia’s Peter Siddle celebrates after taking the wicket of England’s Adam Lyth caught behind by teammate Australia’s Michael Clarke on the third day of the fifth Ashes cricket test between England and Australia at the Oval cricket ground in London. 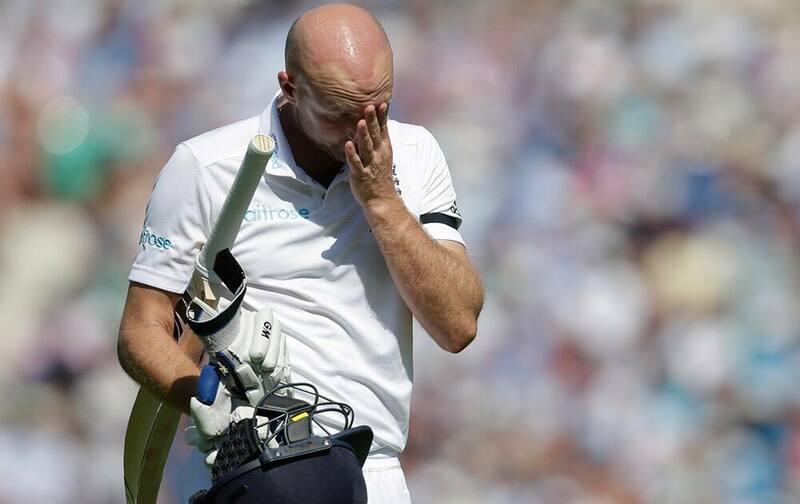 England’s Adam Lyth wipes his face as he walks off the pitch after being given out caught behind by Australia’s Michael Clarke off the bowling of Australia’s Peter Siddle on the third day of the fifth Ashes cricket test between England and Australia at the Oval cricket ground in London. 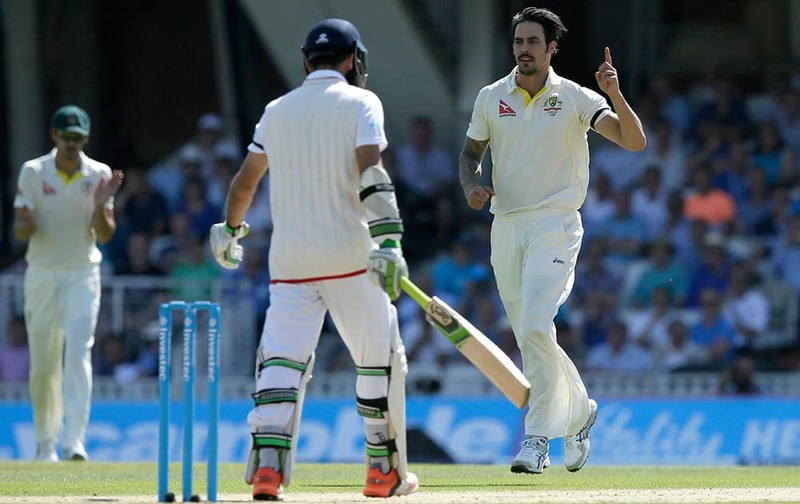 Australia’s Mitchell Johnson celebrates taking the wicket of England’s Moeen Ali on the third day of the fifth Ashes Test match between England and Australia, at the Oval cricket ground in London. 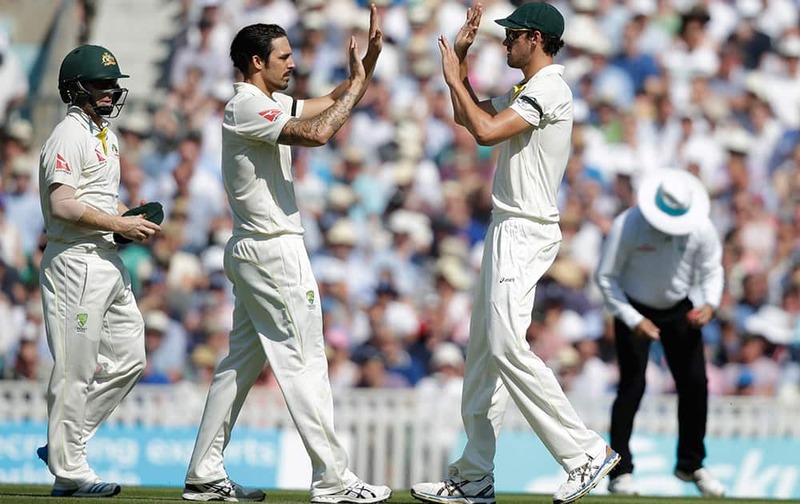 Australia’s Mitchell Starc celebrates with teammate Australia’s Mitchell Johnson after taking a catch to dismiss England’s Mark Wood, off the bowling of Johnson, on the third day of the fifth Ashes cricket test between England and Australia at the Oval cricket ground in London. 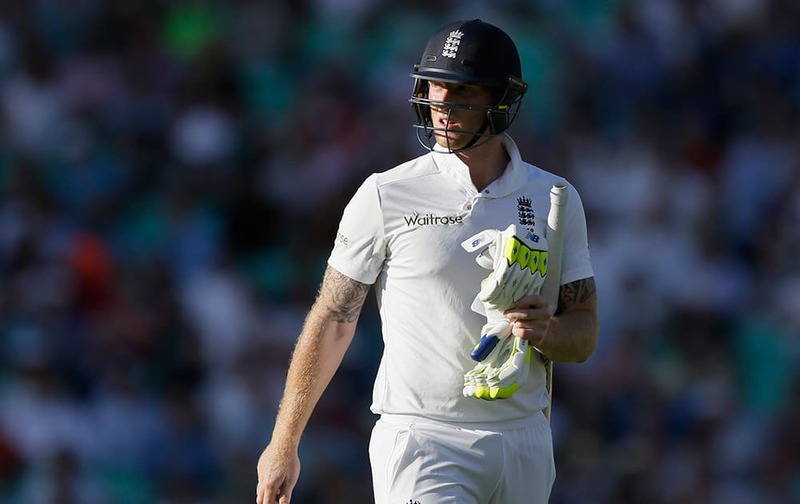 England’s Ben Stokes walked after being dismissed by Australia’s Mitchell Marsh on the second day of the fifth Ashes Test match between England and Australia, at the Oval cricket ground in London. 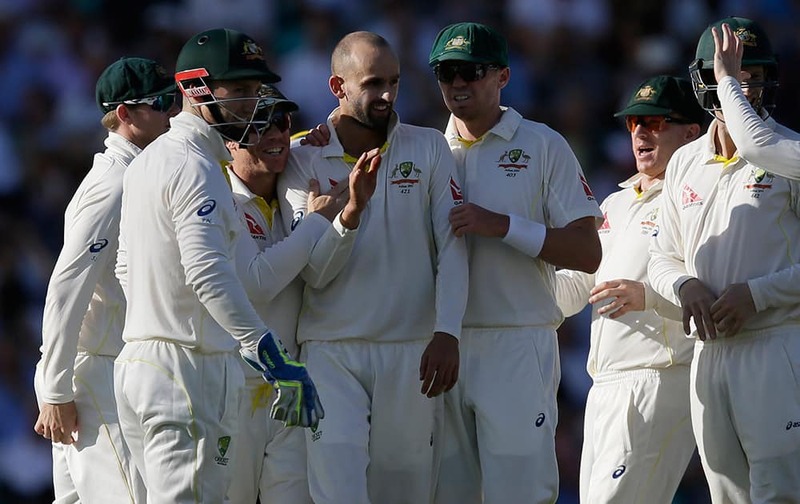 Australia’s Nathan Lyon, centre, celebrates with his teammates after taking the wicket of England’s Jos Buttler on the second day of the fifth Ashes Test match between England and Australia, at the Oval cricket ground in London. 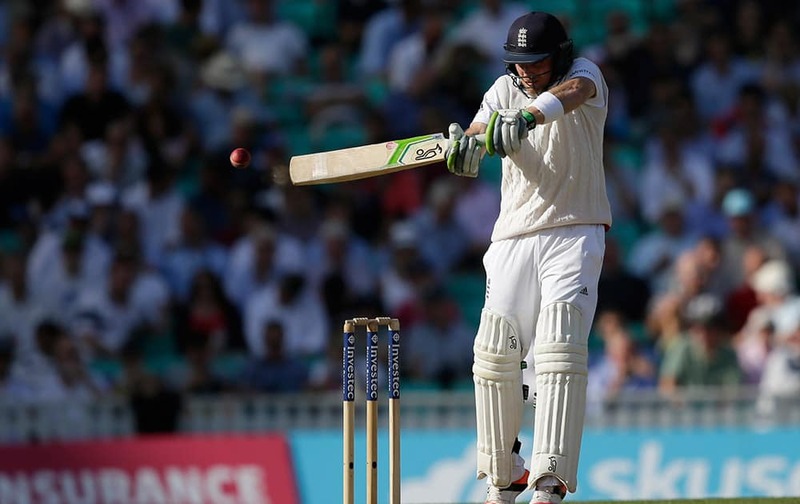 England’s Ian Bell plays a shot off the bowling of Mitchell Marsh on the second day of the fifth Ashes Test match between England and Australia, at the Oval cricket ground in London. 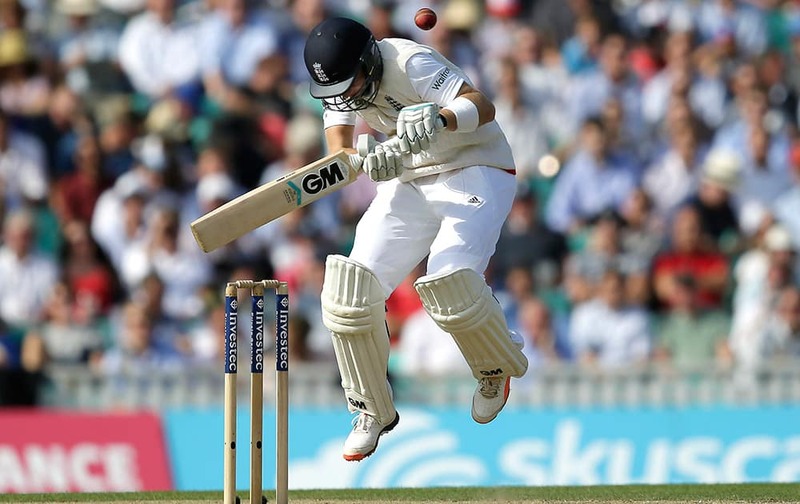 England’s Joe Root tries to play a shot off the bowling of Australia’s Mitchell Johnson on the second day of the fifth Ashes Test match between England and Australia, at the Oval cricket ground in London. 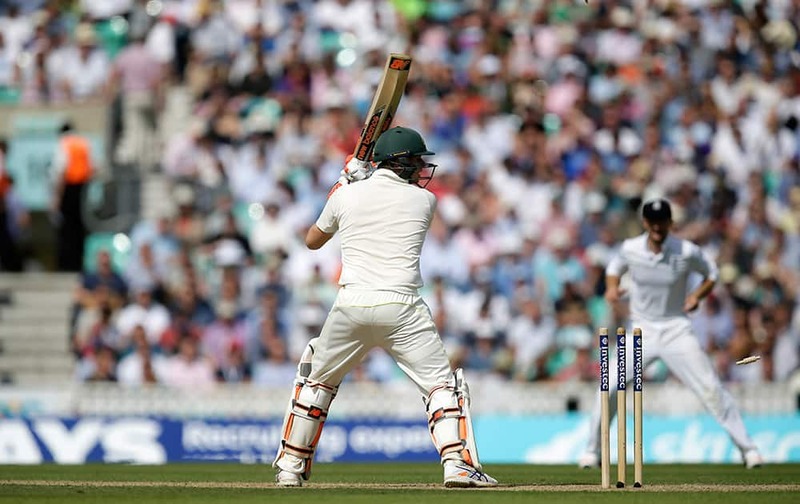 England’s Alastair Cook plays a shot off the bowling of Australia’s Nathan Lyon on the second day of the fifth Ashes Test match between England and Australia, at the Oval cricket ground in London. 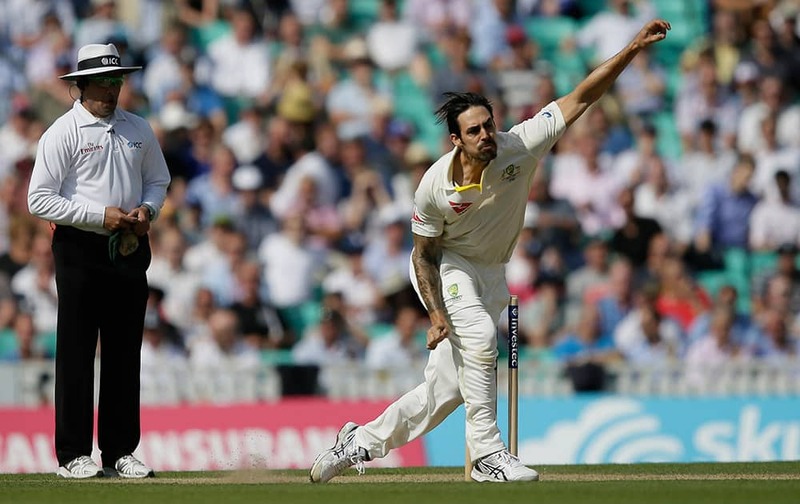 Australia’s Mitchell Johnson bowls the England’s Alastair Cook on the second day of the fifth Ashes Test match between England and Australia, at the Oval cricket ground in London. 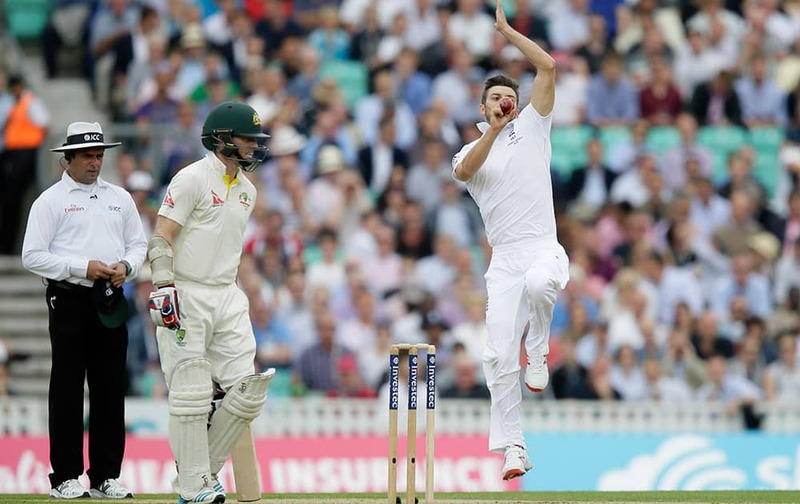 Steven Smith is bowled out by England’s Steven Finn on the second day of the fifth Ashes Test match between England and Australia, at the Oval cricket ground in London. 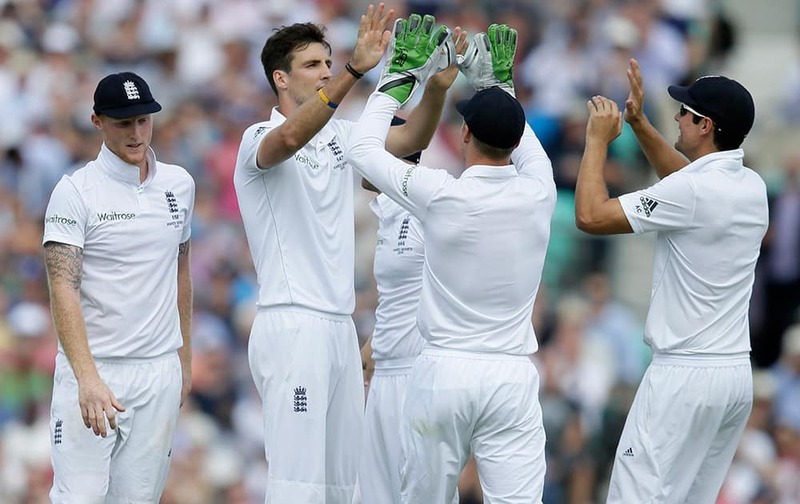 England’s Steven Finn celebrates taking the wicket of Australia’s Mitchell Marsh on the second day of the fifth Ashes Test match between England and Australia, at the Oval cricket ground in London. 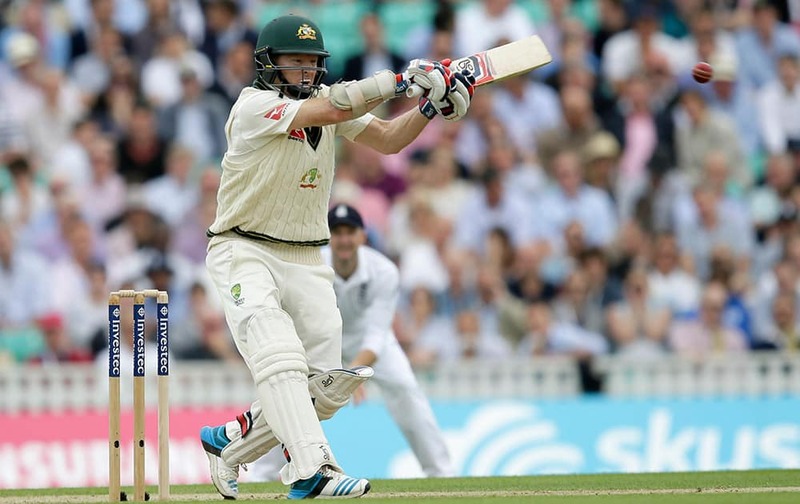 Australia’s Adam Voges is bowled out lbw by England’s Ben Stokes on the second day of the fifth Ashes Test match between England and Australia, at the Oval cricket ground in London. 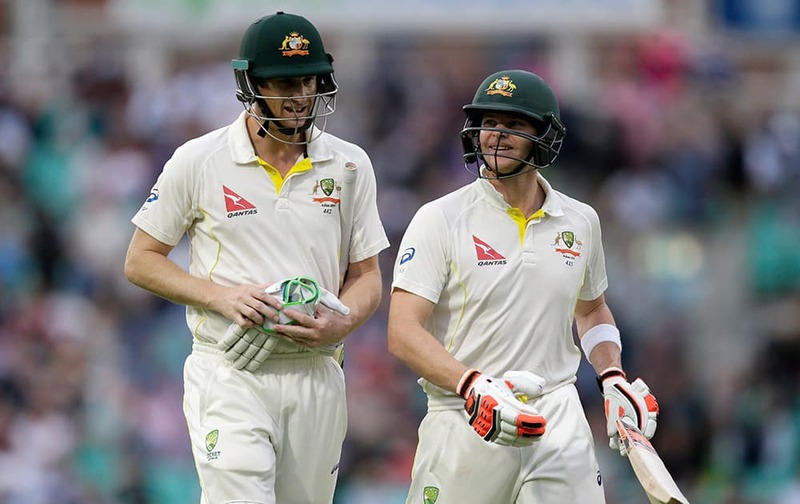 Australia's Adam Voges and Steven Smith leave the field at the end of play on the first day of the fifth Ashes Test match between England and Australia, at the Oval cricket ground in London. 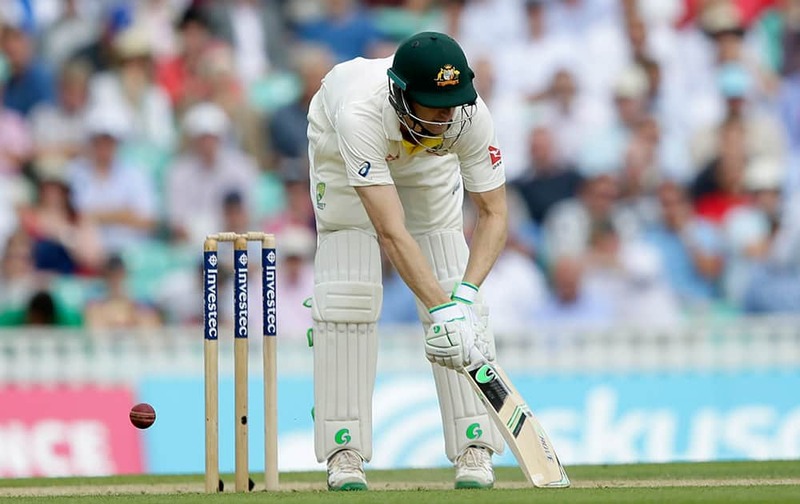 England's Stuart Broad reacts after bowling to Australia's Steven Smith on the first day of the fifth Ashes Test match between England and Australia, at the Oval cricket ground in London. 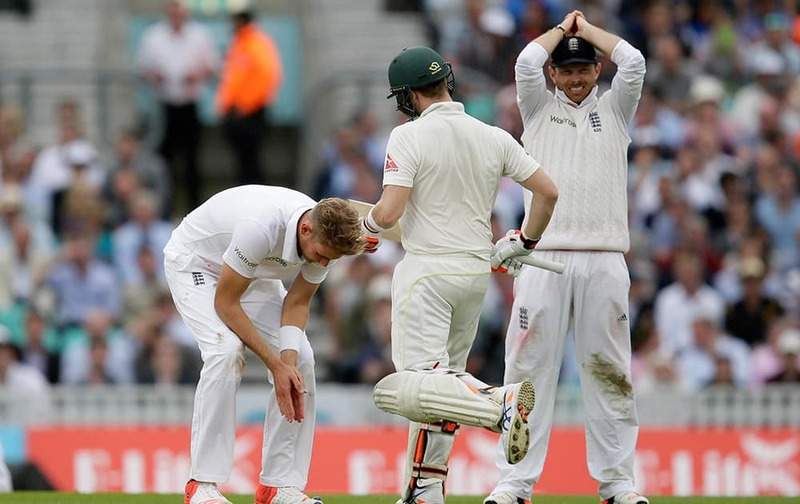 England's Stuart Broad, left, reacts after bowling to Australia's Steven Smith on the first day of the fifth Ashes Test match between England and Australia, at the Oval cricket ground in London. 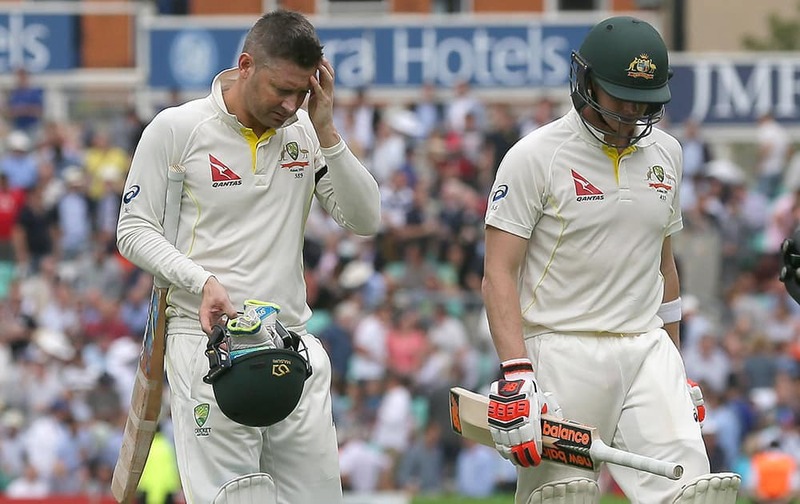 Australia's Michael Clarke, left, and Steven Smith leave the field as they break for tea on the first day of the fifth Ashes Test match between England and Australia, at the Oval cricket ground in London. 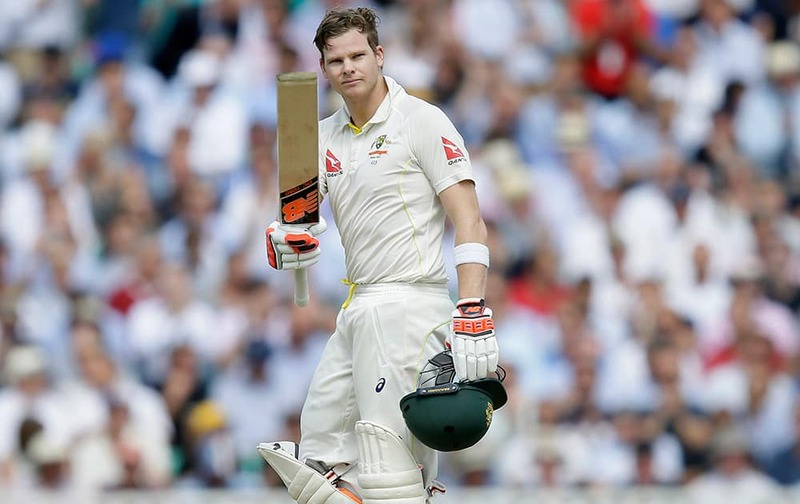 Australia's Steven Smith plays a shot off the bowling of England's Stuart Broad on the first day of the fifth Ashes Test match between England and Australia, at the Oval cricket ground in London. 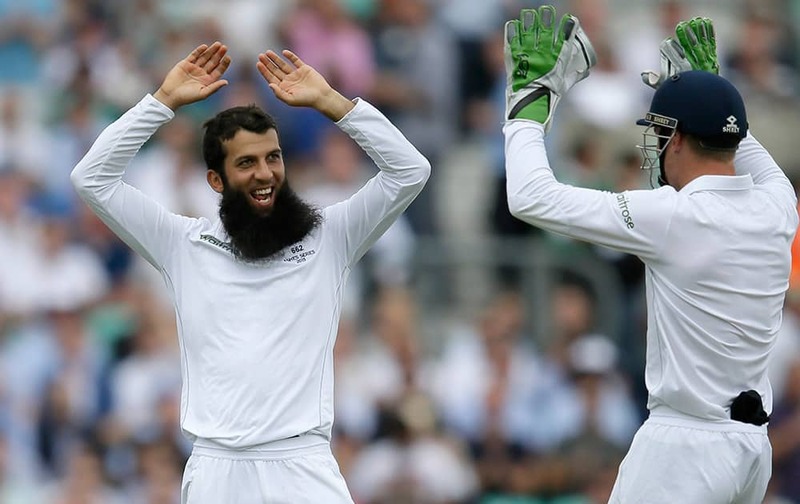 England's Moeen Ali celebrates taking the wicket of Australia's David Warner on the first day of the fifth Ashes Test match between England and Australia, at the Oval cricket ground in London. 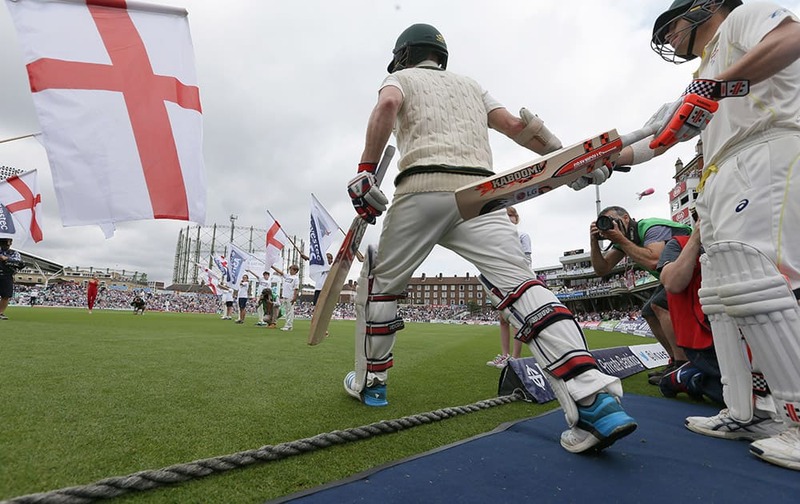 Chris Rogers leaves the field after losing his wicket to England's Mark Wood on the first day of the fifth Ashes Test match between England and Australia, at the Oval cricket ground in London. 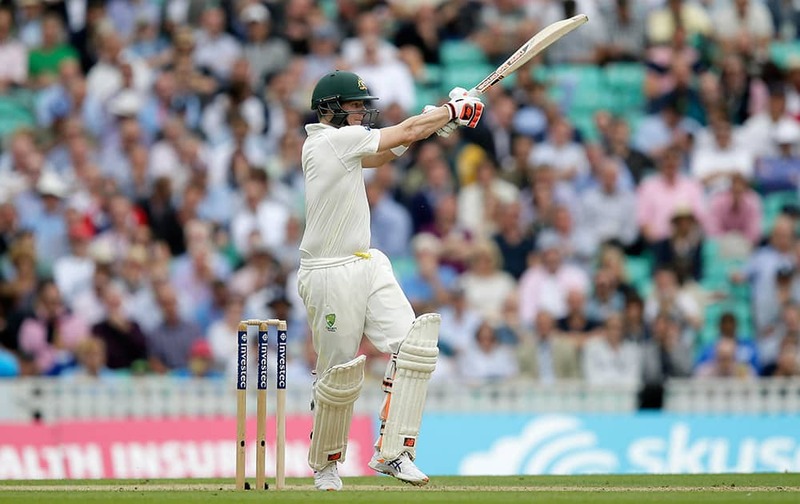 Australia's Chris Rogers plays a shot off the bowling of England's Stuart Broad on the first day of the fifth Ashes Test match between England and Australia, at the Oval cricket ground in London. 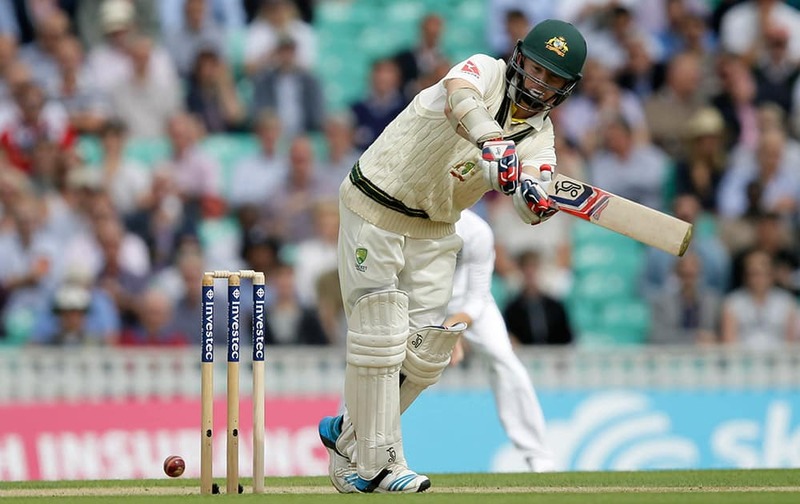 England's Mark Wood bowls to Australia's David Warner watched by Australia's Chris Rogers on the first day of the fifth Ashes Test match between England and Australia, at the Oval cricket ground in London. 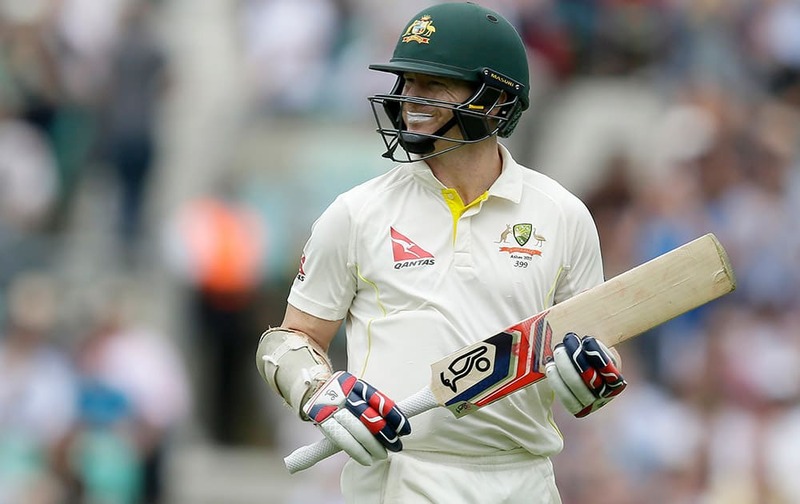 Australia's Chris Rogers and David Warner enter the ground on the first day of the fifth Ashes Test match between England and Australia, at the Oval cricket ground in London.